The April 25 – May 1, 2016, edition of Brian Cormier’s Weekly Update is out! Spring is here – at least for now. We may still be in line for a nasty surprise or two, but I dare say that the tulips and crocuses coming up in the garden (not to mention the large number of urban pheasants squawking for mates in my neighbourhood) are a sure sign that we can put the shovels away and start cleaning up the yard. Speaking of yards, it’s also yard sale time. I’ve never been a huge fan of picking through other people’s unwanted stuff, but I do know people who live for these sales. To them, it’s a sport. Perhaps that’s why I don’t like them. I’ll watch the last five minutes of a Stanley Cup or World Series game to see who wins, but that’s about it as far as sports go. Ever since that career-ending groin injury when I was a trapeze artist in Cirque du Soleil, sports have never meant the same to me. 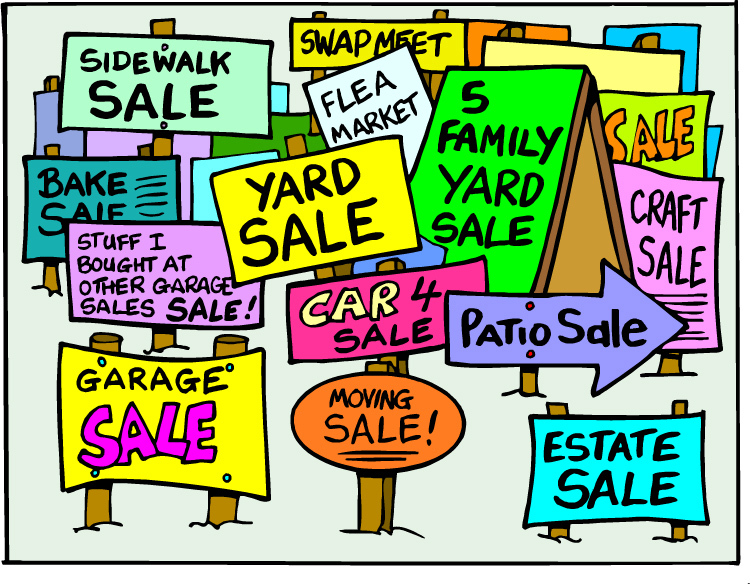 Friends of mine will often have yard sales to make a few dollars by selling their unwanted stuff. The alternative is to just keep piling it up or taking it to the landfill – or donating it to someone who’ll sell it for you and make some money to run their charitable operations. That’s my personal preference, actually: throw everything in a box, give it to someone else to sell and hope they spend the profits wisely. Yard sales are a lot of work! By the time I’d get everything organized, I’d want it out of my house immediately and wouldn’t have the patience to sit around and watch everyone rifle through it for treasures. And if I did end up going through with the sale, I’d probably just sell everything for $5 to the first person I’d see after I’d be sitting out in the cold for 10 minutes. To be honest, though, I have gone to a few yard sales in the past and found a couple of neat things: a rocking chair, bookcases and – most memorably – a couple of handmade quilts. They were beautiful and were being sold by the family of an elderly lady who was moving into a seniors’ home. Everything in the house was for sale. To make matters worse, the lady was there in person watching everyone pick through her memories and walk out the door with them. For some reason, I must have read somewhere to be a tough guy in these yard sale negotiations. Unfortunately, my timing was off. This was not the occasion to be the Yard Sale Godfather. It was the time to be compassionate and understanding. I can’t remember the price she was asking for the quilts, but I lowballed her something awful and, quite frankly, insulting. They were beautiful, quality made and heavy. The stitching was exquisite. You could just imagine her sitting in front of the fireplace in the middle of winter making her quilts while watching Little House on the Prairie with her cat. And when she was done, she’d polish her rosary beads with holy water and pray for all the sick children and lonely puppies of the world. Her daughter jumped into the negotiations and told her to just let them go for the price I wanted. Grandma didn’t say much. She just nodded silently and sadly. I paid and left. Had I walked by a mirror on the way out, I swear that I would have seen the reflection of Satan looking back at me – and deservedly so. After that, I came to the conclusion that I should just not go to yard sales for fear that I would make another grandmother cry by turning into a super competitive negotiator from hell. To tell you the truth, I never truly enjoyed the quilts because of the guilt. They’ve been in a storage bin in my basement for years. Your sad grandmas can all sleep well tonight, though, folks. Satan the Negotiator has retired. 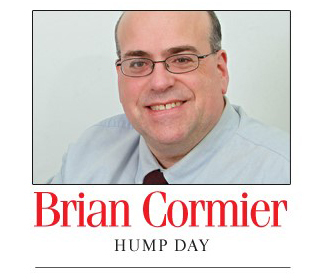 The April 18-24, 2016, edition of Brian Cormier’s Weekly Update is out! Hump Day: Call before visiting or risk the frying pan! Thanks to technology, we’re constantly communicating yet we’re never in the same room together. And when we are, we’re often on our smartphones talking to others who aren’t even there. Remember the good old days when you actually had to talk to the people who were in the same room with you? Years ago, I remember our family used to go for Sunday drives and would often just drop in on relatives. It was normal. Everyone visited each other. Sometimes we called first. More often than not, it was unannounced. We just barged in. I would strongly suggest that people who know me don’t try that today. First of all, my doors are always locked. I have no idea why. It’s just the way I’ve always done it. When I was a kid, we only locked our doors when we went on vacation. Now, I lock my doors like I’m protecting the crown jewels of the British Empire. I’ve gotten used to planning ahead. If I’m going to someone’s house, I’ll always call first. 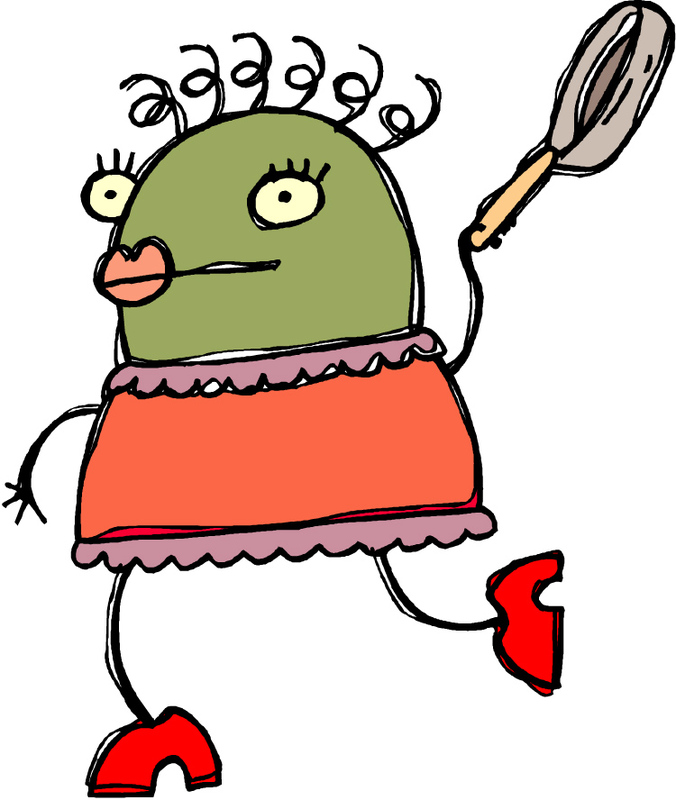 I prefer when people call me first to let me know they’re coming over – you know, so I can put on my face and fluff up my knickers to make myself presentable. I wouldn’t want to answer the door wearing cold cream all over my face, curlers in (what’s left of) my hair and a ratty old bathrobe with pictures of kittens on it. After all, there’s only so much lust a person can feel all at once, and I wouldn’t want to be the cause of any sinful thoughts. I’m pretty sure we even showed up at my grandparents’ place on P.E.I. a couple of times without calling first. “Hi, we’re here for two weeks! Hope you don’t mind!” My grandmother would come downstairs in the morning after we’d arrive there late at night to find various grandchildren strewn about sleeping. My grandmother was a very kind and gentle woman. If it were me, I would have pepper-sprayed everyone and asked questions later. “Why didn’t you call first? ?” I’d scream as various sobbing kids ran around crying trying to rub chemicals out of their eyes. Like I said, call next time! Back then, when someone knocked on your door or just walked in, it was usually someone you wanted to see. Today, if someone rings my ‍doorbell unannounced, it’s either a delivery person with the wrong address, someone trying to convert me to their religious beliefs or a telecommunications company sales representative trying to get me to change providers. That might work! Throw in the free pizza from the delivery guy with the wrong address and sign me up! I usually always call someone before going over unless I know for sure that they’re home and don’t mind drop-ins. Those are few and far between, however. And if I do drop in, I’ll call from my car before ringing the ‍doorbell to ensure they’re at home and not running around half-dressed. I’m sure we’ve all caught people at home by surprise in various states of unpreparedness. A friend of mine used to deliver for a courier company and he had some mighty interesting stories about home deliveries! I miss those days of being relaxed enough to enjoy having people drop by unannounced. I’ve grown so regimented that having someone spontaneously visit throws me completely for a loop, but I wish it weren’t that way. I grew up with surprise visitors at home all the time. I didn’t mind it then. It was just the way it was. We all did it. Sure, some people called ahead, but many didn’t. The door opened and they just walked in. If someone walked into my house these days, they’d get clobbered with a frying pan – after the pepper spray, of course. You’d think I’d been the victim of a home invasion at one point! I miss those old days. And truth be told, I don’t really own pepper spray, so I suppose you can drop by to say hi as long as the frying pan is soaking in the sink and I can’t reach it. The April 11-17, 2016, edition of Brian Cormier’s Weekly Update is out!